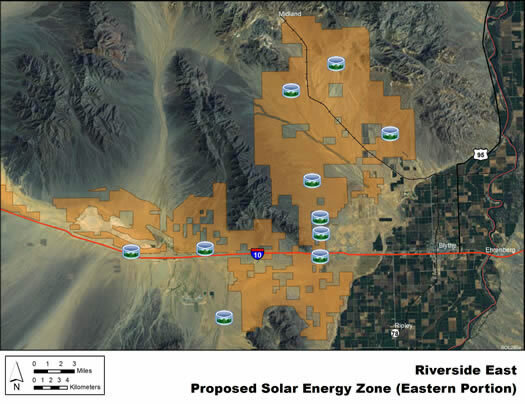 The Riverside East solar energy zone (SEZ) is located in California on BLM-administered land within the Palm Springs South Coast Field Office. 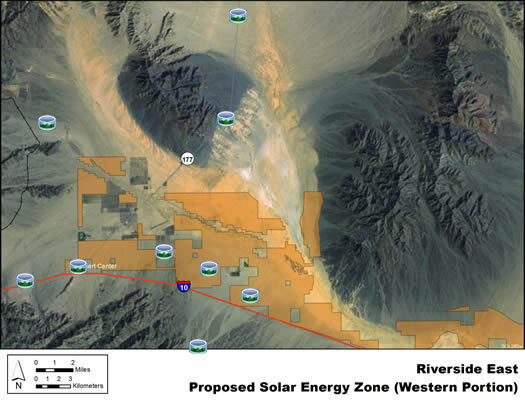 There are two solar approved authorizations within the Riverside East SEZ, Application 48880 for a 1,950 acre concentrating solar power (CSP) parabolic trough facility, and Application 48811 for a 7,025 acre facility (originally to be a parabolic trough facility; now changed to PV). The Riverside East SEZ is the largest of the SEZs. In the Draft Solar PEIS the proposed total area of the SEZ was 202,896 acres (821 km2). In the Supplement to the Draft, 43,439 acres (176 km2) in the northwest portion of the SEZ were eliminated to reduce impacts on Joshua Tree National Park. In addition, 11,547 acres (46.7 km2) within the SEZ boundaries were identified as non-development areas. The remaining developable area within the SEZ is 147,910 acres (598.6 km2). No additional changes to the SEZ developable area were made in the Final Solar PEIS. The Riverside East SEZ is located in Riverside County in southeastern California, within Chuckwalla Valley, the southern portion of Palen Valley, and the California Desert Conservation Area (CDCA). The eastern boundary of the site is about 6 mi (10 km) west of the Arizona border. The revised western boundary is approximately 0.7 mi (1 km) from Joshua Tree National Park. In 2008, the county population was 84,443. The closest large cities are Moreno Valley, San Bernardino, and Riverside (all located slightly more than 100 mi [161 km] west of the SEZ on I-10). Flat basins form broad expanses of barren plains in the Riverside East SEZ. Much of the SEZ consists of flats with widely spaced creosote bushes and other low shrubs, but there are also dry lake beds, sandy areas, and dry washes with ironwood and other trees. Some areas are devoid or nearly devoid of vegetation. In addition to I-10, State Route 177, and Midland Road, several gravel and dirt roads cross the SEZ. Transmission lines also cross the SEZ. An abandoned railroad runs through the eastern portion. The Midland Long Term Visitor Area is also located on the east side of the SEZ. While the lands to the north and west of the SEZ are generally undeveloped mountains, the lands to the southeast are agricultural, and there is development along I-10 just south of the SEZ, though areas south of the SEZ beyond I-10 are generally undeveloped. The small town of Desert Center is located at the far southwestern edge of the SEZ, along Interstate 10 (I-10). There are ranches, homes, and associated structures located on private lands near the SEZ, as well as local roads and airstrips. Scattered tanks and other structures associated with ranching and farming are visible from the SEZ, as well as the abandoned Eagle Mountain Mine and Ironwood State Prison. I-10 runs east–west along the southern boundary of the SEZ, State Route 177 runs north–south through the western section, and Midland Road crosses the northeastern portion of the SEZ. U.S. 95 runs north–south about 3 mi (5 km) from the eastern boundary of the SEZ. An existing 500‑kV transmission line runs east-west along I-10 and parallel to the southern SEZ boundary. In addition, a 230‑kV line passes through the far western section of the SEZ, a 69‑kV line passes through the eastern portion of the SEZ, along with other transmission lines. As of May 2012, 7 solar project applications were pending in the SEZ, and 2 projects had been authorized within the SEZ (one of the authorized projects will require additional case processing and environmental review to consider a post-authorization request to change technology to PV). The combined areas of these applications cover about 57,000 acres (231 km2), about 39% of the SEZ developable area.